This post was written by Nic Baird, a Career Launcher on Parker Dewey and a student athlete studying at Yale University. It seems that the life of a student-athlete at most universities gets busier every year. If a team doesn’t use up its maximum allotted practice time regulated by the NCAA, and then some, it simply can’t compete with others. Athletes work full time, 35 hour per week jobs on top of academic commitments. This dedication is admirable and can connect athletes to an insular group of alumni connections, but what if the athlete wants to do more than discuss the current season or isn’t interested in becoming a professional in his or her sport? While athletes are at practice, their classmates are busy running student investment groups or helping in local non-profits. They are exploring career opportunities and developing relevant skills in their free time by engaging with the campus community. Athletes do not have the luxury of free time. Most sports teams even require that athletes compete or practice over the summer as well, restricting their ability to get internships. As a result of such a schedule, it’s difficult for the average student-athlete to communicate and connect with alumni about professional topics unrelated to their sport. So how does a student-athlete 1) discover what he or she is interested in career-wise, 2) gain relevant skills, and 3) engage with alumni about professional aspirations? As an athlete at Yale, I can speak to these challenges. My weekly schedule consists of practice four days a week, competitions all weekend (usually not at home), and strength training three days a week, for a total of five hours per day, six days per week, not including travel. Classes are twenty hours per week, and then I need to do homework. In addition, I’ve competed every summer limiting my opportunity to gain an internship experience. Luckily, I’ve been able to build a resume through on campus internships, which has helped me discover what industries I would enjoy and excel in (not academia…), and has allowed me to communicate those interests to alumni, which have been the primary tool for most seniors in finding a job. But even these internships have been difficult to balance, as they are normally semester-long jobs which can be overwhelming with the schedule of an athlete. Fortunately, our team hosts a number of alumni events to help us network with graduates who are successful in the professional world. I hosted one of these events recently. Twelve alumni were brought in to discuss their work ranging from graduate students to bankers to entrepreneurs. At one point, we broke up into groups to discuss different career paths and of the thirty athletes in attendance, only four were able to make a decision immediately on which group to join. The rest wandered, confused and unsure of where to go because they did not know what career path they were interested in. At a career panel full of alumni, who are there for the sole purpose of helping athletes, the athletes were entirely unable to engage. When asked why, they explained that they simply haven’t had the experience to understand their interests. I could certainly understand my teammates’ struggle as my first job was in an area I had no prior knowledge or experience, and only available because of a friend who was working at a startup and needed some help evaluating the video game industry. Through the opportunity, I discovered that I have a deep interest in that space, and I am now pursuing Esports as the primary industry in my job hunt. That was luck, though, and the connection was a former teammate who happened to know me quite well. For those that are not so lucky, how can one know what work do and do not enjoy without any experience? Furthermore, even if those of us without any available time can learn which direction to go in, there is still the challenge of communicating with relevant alumni effectively. 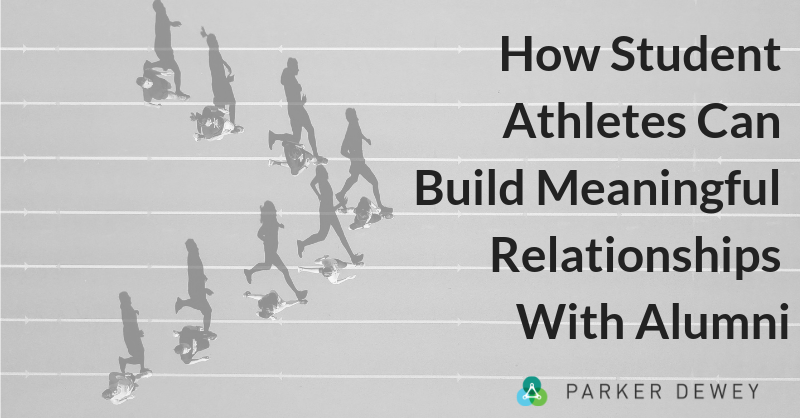 Former athletes know some of the skills that athletes bring to the table, like leadership and dedication, but in order to connect on a professional level, it is essential to convey how the skills demonstrated on the field apply in the office. Without concrete professional experience, it is difficult to convey these skills to employers. This issue is amplified when connecting with university alumni who might not have been athletes. Without a way to demonstrate skills, an alumni’s perception of an athlete’s skills will be much lower than reality. In fact, a study by the National Association of Colleges and Employers shows that employers and students’ perceptions of their proficiency in certain skills differs heavily. For example, the percentage of students who rated their leadership skills proficient was 70.5%, while only 33.3% of employers considered student’s leadership skills to be proficient. This disparity in perception can be found equally in other skills such as written communications and critical thinking. How can athletes bridge this gap in perception and communicate on equal terms with alumni and employers without formal experience? For me and some of my teammates, small, short-term odd jobs and Micro-Internships have solved both of these issues. It does not take long to discover what isn’t an interest. Micro-Internships, like the experience I had in the gaming industry, have guided my career pathway to a point of clarity, mostly because I experienced what I wasn’t good at, but also because I experienced a few jobs I loved. These experiences allow me to know which alumni I want to speak with, in which industries, and even in which job categories. They also demonstrate my skills, which I can then use to effectively communicate with alumni about professional experiences outside of my sport. Thanks to Micro-Internships, I know where I can be successful, and I have the resume to back it up, all while gaining valuable skills that athletics teaches. As a result, I am able to reach out to alumni in fields I’m interested in and develop meaningful connections with them.